The Special Edition of RETURN OF THE JEDI marks the end of the middle STAR WARS trilogy, and also marks the finest use of enhanced and brand new visual effects shots. The Industrial Light & Magic crew created enhancements for JEDI that supported the narrative much more clearly than for STAR WARS and THE EMPIRE STRIKES BACK. All of the re-compositions of original visual effects shots look fantastic, just as they did in the first two films of the Special Edition trilogy. All of the matte lines and garbage matte lines (artifacts of optical matting) are absent, and color and brightness values are consistent and sharp. The finest 'enhancement' sequences of the entire trilogy occurs as Jabba The Hutt prepares to execute our heroes by casting them into the Great Pit of Carkoon, resting place of the all-powerful Sarlacc. In the original version, we only saw a full size hole with puppet tentacles appearing from the center. The entire Sarlacc sequence was originally shot in Yuma, Arizona--we never really saw the beast, only the tentacles. That has all changed. Using only original footage from the film, CG artists created the Sarlacc beast--essentially, it's a large, brown mouth. The poor souls who fall into the Pit now get swallowed by the huge mouth. The CG Sarlacc is absolutely wonderful--the model looks highly realistic, the animation is subtle, and the compositing and match-moving is fantastic. 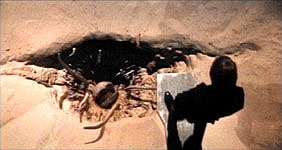 Audiences seeing JEDI for the first time will probably never realize that Sarlacc was created long after the fact, much less that it is a fully computer generated effect. The Sarlacc sequence represents the finest 'enhanced' sequence of the trilogy. The Pit is now much more menacing and dangerous, adding to the tension and drama of the entire scene. Our first view of Jabba's huge Sail Barge is actually a brand new two-shot sequence. A herd of Banthas, previously only seen in STAR WARS, is seen traversing the Dune Sea. The shot then cuts to a very wide shot of the Banthas, then pans to Jabba's Barge, in this convincing sequence. into the hand-held overhead shot from the original version. The Sarlacc beast is now quite visible in this enhanced shot. Sarlacc was created and animated as a highly photorealistic CG model. whether the shots are hand-held or rock-solid, are all of the highest quality. Jabba's Palace features some new and interesting characters, including the now fully-computer generated Sy Snootles. In the original film, Snootles was created as a live on-set rod puppet. All shots of the rod puppet have been completely removed, and replaced with a new CG Snootles. Although the model looks great, the animation was a bit jerky. The choreography was quite nice--I liked the subtle hip movements, but the overall body movement wasn't as smooth as ILM's CG Martian work in MARS ATTACKS!. Another singer in the band is the all new Joh Yowza, also produced as a CG element. The fur on Yowza is quite realistic, as well as the movements and textures. The ILM CG units have made some terrific advances in creating believable CG fur in THE FLINTSTONES and JUMANJI, but never with as much success as with Yowza. I really liked some of the subtleties to Yowza, especially the tight shot of his singing mouth, where you could see his (her?) uvula. A little aside: it's too bad that George Lucas decided to replace Sy Snootles with a new CG model--instead, he should have replaced Rancor monster. The Rancor is the only element of the film that seems quite outdated--although its creation was a great achievment in 1983, the sequence is now dated and far too slow and awkward. I thought the whole point of the Special Editions was to enhance elements that would look strange to today's more sophisticated audiences. The Rancor appears to be a perfect candidate for the CG treatment. Oh, well. detailed CG character animation ILM has ever attempted. version, a live-action rod puppet was used to represent the lead singer. The next significant enhanced shot occurs as the Death Star is blown up by the Rebels. Similar to the destruction of the original Death Star and Alderaan in STAR WARS, a shockwave now is seen eminating from the center of the explosion. ILM really likes this effect, first used effectively in STAR TREK VI back in 1991. The original ending of JEDI was a bit anti-climactic. The Empire has fallen, the Emperor destroyed, and all we ever saw was a few teddy bears dancing around. The Galactic repercussions of this event were never felt. ILM has added many all-new shots depicting the celebration around the galaxy over the Rebel's victory. The tilt up from Darth Vader's burning body dissolves from Endor's fireworks to a cool shot of Bespin's celebration. Much like the all-new wide shots from EMPIRE, the Bespin shot is rich in color and depth. The shot wipes to a two-shot celebration on Tatooine, with the city streets of Mos Eisley jammed with celebrating people. The action then moves to the never-before seen world of the Empire's home, Coruscant. The art direction and design of the skyscrapers of Coruscant is quite elegant and electrifying; the deep purples and reds are sharp and crisp. The wide shot of the Emperor's statue being toppled is awe-inspiring. However, the camera movement in the first Coruscant shot is a bit extreme. The celebration sequence features a fantastic new musical score, written by the original composer John Williams, who puts an emotional cap on the trilogy that was previously missing. One of Lucas' primary directives when he created Industrial Light & Magic was to create completely alien environments. In the late '70's and '80's, ILM relied heavily on traditional matte paintings. Now, with new digital tools such as CG imagery and digital compositing, ILM can create highly realistic wide shots of alien worlds at a much more advanced, dynamic level, by including camera movement and exciting, realistic action within the shot. The last sequence in JEDI is certainly a taste of things to come for the STAR WARS prequels. that takes place on the Forest Moon. were composited to create this stunning shot. enhanced miniatures, computer generated ships and digital matte paintings. motion-control shot miniatures, and (of course) bluescreen shot extras. Check out American Cinematographer Apr. '97.